E-Power Machine, Electro Reflex Energizer. HTE PRODUCTS: Regulations to obtain a medical device license are very strict and classification takes time, also requiring proof of safety and effectiveness, all of which have been achieved by the manufacturer HTE in three very health conscious countries, Japan, Australia and Canada, who Bloomberg ranked amongst the healthiest countries in the world 2016. The Sun Ancon Chi Machine is licensed and classified as a medical device in the following four countries. The Canadian head office for HTE was issued medical device licenses by the Therapeutic Products Directorate, Medical Devices Bureau under Health Canada. Their Mission: To ensure that drugs, medical devices and other therapeutic products available in Canada are safe, effective and of high quality. FYI: eBay and Amazon.com: HTE does not sell on either mentioned website. If a Chi Machine is not identical to this photo above, it is an imitation. Note the green and gold logo on both the machine and timer. The Chi Machine is a Therapeutic Massager. Benefits of using the Chi Machine include temporarily relief of muscular aches, pains and tension caused by fatigue or overexertion, and temporarily promotes local blood circulation. The Chi Machine relaxes muscles locally and provides a full body gentle massage. 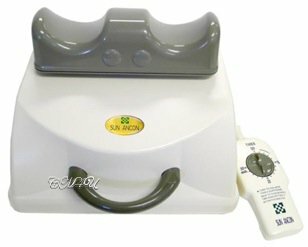 The Chi Machine operates with the user lying on their back and placing their ankles on the footrest on top of the machine. The timer switch is dialed to the user's preferred amount of time (2-6 minutes for first time users - 15-20 minutes maximum with consistent daily use). The footrest moves back and forth, carrying the user's feet from side to side. This movement carries up through the legs, torso and up throughout the entire body, causing the user to sway back and forth, like a fish swimming. The foundation of health generated by a simple machine. 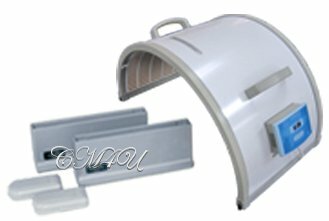 The Far Infrared Dome is a portable FIR (Far Infrared Ray) topical warming unit, that has an arched 160-degree design that increases warming coverage to benefit the body. Height extensions are included and so is an armrest. The FIR Dome produces a warm and comfortable feeling and is a perfect adjunctive therapy to massage and other modalities. It gently elevates the body's surface temperature and helps to expand capillaries and promotes blood circulation. The Grande FIR Dome, a larger version to accommodate larger bodies, is designed to provide an extra 45% of space for more FIR treatment. It is 2 inches higher and 5.4 inches wider than the regular dome. Regular Dome: L26.3" x W14.5" x H13.8"
Grande Dome: L31.7" x W14.5" x H15.8"
Ancient, natural healing, updated and modernized. All living things generate Far Infrared heat, needed to survive and thrive. Electro Reflex Energizer (ERE) is a foot massager with 4 settings: Stimulation, Pounding, Relaxing, Massaging and combination. Remote controlled. The user sits in a chair and places their feet on the device pads. Six electro pads can be plugged into the device and placed on the shoulders or waist area for stimulation. The Electro Reflex Energizer helps to relax and revitalize the body and keeps feet warm and soothed by gentle heating stimulation. The massager soothes and refreshes aching feet with the penetrating massage action. The Electro Reflex Energizer relieves aches and pains, eases tension, relieves fatigue, and promotes local blood circulation. The x6 electro pads (acting like TENS units), provide the same soothing massage action. The E-Power massager improves blood circulation and warms the skin. Helps to relieve muscular pain, cramps, spasms and tension. E-Power may help to relieve symptoms of arthritis, insomnia and arthrodynia. 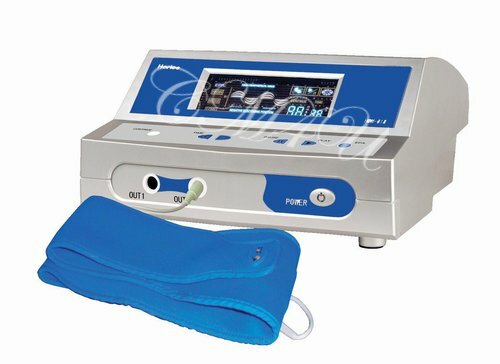 Electro Therapy pain relief device, also for health, energy and beauty. The E-Power machine stimulates and promotes re-connection and communication of the circuitry of the body, promoting pH balance, boosts negative ions and ATP energy. The future has arrived today.